My dad convinced me to open up Urban Waxx, and he never even knew it. My Dad was a complicated man. He was many things, to many people, throughout the course of his life. When I was young, he was a giant to me. He wore suits to work every day, and a hat when it rained. He would commute the 90 minutes from suburban New Jersey, where I grew up, to his job as a graphic designer on Madison Avenue. In the evening I would wait for him at the end of our driveway as he took the long walk home from the train station. I would see him walking, with purpose, from far away down Northfield Road, to me. I would get SO excited to see him, and he would greet me with a wide grin and swing me up into his arms. He carried a brief case, he shined his shoes in front of the TV every night. He was as punctual as my mom was tardy. He always cleaned his plate. He rarely got angry but when he did the ground would shake. He had a devilish sense of humor and at the dinner table, we all tried to keep up with him. I often won his approval by being the funniest. In my house, it wasn’t necessarily the best student or most athletic that garnered favor…but the most interesting and the most funny…yes, those were the awards that everyone gunned for. My dad smoked a pipe and was a voracious reader. He loved music and bought me my first Beatles tape (Abbey Road) when I was 8. He was creative. He was hard working. He was charming. He was also divinely flawed. My mom and dad had an incredibly messy divorce when I was 16. At the time, my parents and their divorce seemed embarrassing and inconvenient and so deeply tacky to me. I pronounced to all who would listen that it was a relief that my parents had split and that my father had been transferred to Dallas. Of course, we all know now that the rantings of an angsty 16 year old have little weight in the grand scheme of things. I was mostly angry at my father. It is a terrible thing when a girl realizes that her father is just a man. Just a man who makes mistakes and causes pain and doesn’t know how to say sorry to a very outspoken teenage girl. 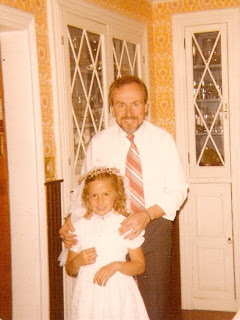 As the years passed, my relationship with my dad ranged from cordial to deafening silence. He remarried, he stayed in Dallas. I graduated college in Arizona, went back to the East Coast, and my resentment toward my father grew to epic proportions. I would tell my friends that my lack of a relationship with my dad did not affect me, but the bitter sadness in my words didn’t fool anyone. When I turned 30, my dad extended an olive branch. We hadn’t spoken for a few years at this point, and at first I was quite skeptical. My dad was never good at taking accountability, and even worse at apologies, so I wasn’t expecting much. To my surprise, he had changed. The years between us had pushed him into therapy, and with his therapy had come some serious soul searching. He came to Charleston, where I was living, and we spent a weekend together…talking. He went through all of the things that he felt he owed me an amends for, and I mean ALL of the things. I wasn’t a parent then but as a mother now I know I cannot imagine what it would feel like to have that rift between my child and me. What a terrible thing. We spent the weekend crying. And laughing. And when it was over…I felt peace. I felt clean. I was relived of all that horrible anger and disappointment and sadness that I had been carrying so closely to my heart for so long. I had my Dad back. I moved to Portland in January of 2007. I had procured a terrible job at a terrible spa (now long gone) in the Pearl. It was owned by an extremely dysfunctional couple and every day was like a toxic circus. I was sitting at the front desk of that terrible spa when my sister called me and told me that I needed to get on a plane, now, and fly to Florida. My dad had been vacationing there, and he had gotten sick…very sick…and was in the hospital. She told me to come, now. I didn’t ask many questions. I got up, left the spa, and quickly made my way to the airport and then to Florida. My dad was not sick. My dad was dying. My father, who was a runner, and a competitive swimmer, also had weak lungs scarred from childhood illness. My dad was stubborn as a mule, and although he was supposed to be using oxygen to combat the poor Dallas air and his weak lung strength, he wasn’t using oxygen. He was pretending, like he was prone to do, that he was fine. He wasn’t fine. He had contracted pneumonia, and it was taking him out. I stood by my dad’s bed with my sisters and my brother. It was the first time we had all been together in at least 5 or 6 years. My dad, that man who stood so tall and so proud, that man that was a giant to me, laid in the hospital bed, intubated, looking so frail and small that it didn’t seem possible. I held his hand and it was cool, and his skin felt papery. Even though he was barely conscious he heard us, and it was like we were little at the dinner table again. We all tried to make the best jokes, we tried to get him to laugh, we tried to win the award for most clever. My dad died on March 16. When he was gone, I remember standing on a street corner downtown. I had just gotten a coffee and it was raining. I remember looking around and wondering how everything could still be going. How could the world just keep moving, as if nothing had changed. How could everything be the same even though nothing was the same. I had dabbled with the idea of opening my own business before my dad got sick, and I had even talked to him about it, but I was afraid. I wasn’t sure if I would be able to succeed. He had told me, “Shannon. Just do it. What have you ever tried and really wanted and not been successful at?” His death was all of the motivation I needed. Death has a funny way of crystalizing what is important, you know? I suddenly knew that I was done wasting time. Done working for places that were awful. Done being afraid. I miss him. I tell my kids about him, and how much he would have loved them. He would have found them to be so delightful. He would have laughed at all of their jokes. I think about him walking into an Urban Waxx and looking at the details. I think he would have loved the design, the order, the details, the warmth and the laughter. I would love to have been able to ask his advice when things got really, really hard. I would have loved to have him celebrate with me. I think, now, that my dad would be proud of me. And that makes me happy.